Last Thursday, the U.S. House of Representatives passed the American Health Care Act, or TrumpCare, on a 217-213 vote. The bill would end health care for 24 million Americans, dramatically increase insurance premiums by legalizing price discrimination against seniors, and repeal protections for those with pre-existing conditions – all while giving the wealthiest Americans a $600 billion tax cut. Cancer, diabetes, pregnancy, asthma, and more would all be pre-existing conditions for which insurance companies could discriminate against patients should TrumpCare become law. 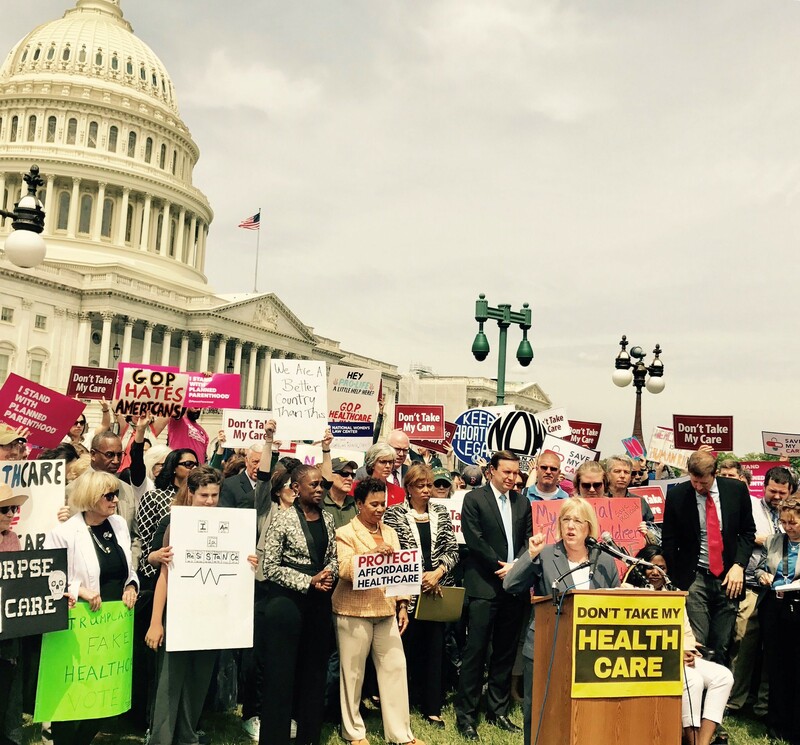 We all know the big news this week was the U.S. House of Representatives passing TrumpCare, the bill to repeal the Affordable Care Act. But now the legislation goes to the Senate, where it has a long way to go before passing into law. On a 217-213 vote, the U.S. House of Representatives today passed the American Health Care Act, or TrumpCare. According to independent and nonpartisan analysis, the bill would take health care coverage away from 24 million Americans, raise premiums as much as seven times over, and end protections that ensure coverage for pre-existing conditions – all to pay for a new $600 billion tax cut for the rich. Last week we had a great meeting of the state party central committee in Walla Walla. It was fun connecting with so many Democrats and seeing the energy and enthusiasm for our party, especially in Eastern Washington. We’re fired up to compete across the state in our 2017 and 2018 elections! Saturday April 29th represents the 100th day of Donald Trump’s presidency, and in that time his entire agenda has hurt working families and the middle class. From executive orders to legislative action with Congressional Republicans, Trump has spent 100 days slashing benefits, wasting taxpayer money, and eliminating protections for families, communities, and our environment. The Washington State Democratic Central Committee is in Walla Walla this weekend for our April meeting. We’re excited to be participating in a virtual “March for Science” and talking about Earth Day and the importance of protecting our environment against climate change. Former RNC staffer and candidate for the 45th LD Senate seat Jinyoung Lee Englund was registered to vote outside of the 45th district with a mailing address in Virginia as recently as April 4th, according to data provided by the Washington Secretary of State’s office. According to a data file of registered voters provided by the Secretary of State's office on April 4th 2017, Englund was registered to vote in the 48th LD at 17020 38th Pl NE, Bellevue WA 98008, with a mailing address at 181 East Reed Ave Unit 103, Alexandria VA 22305.